Health impact assessment is being used to support and deliver healthy and sustainable communities in major urban areas around the world. 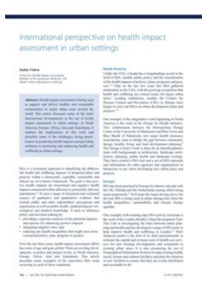 This article discusses some of the latest international developments in the use of health impact assessment in urban settings: in North America, Europe, Africa, Asia and Australasia. It outlines the implications of this work and describes some of the challenges facing practi- tioners in predicting health impacts and providing solutions to protecting and enhancing health and wellbeing in urban settings. Over the last three years, health impact assessment (HIA) has come of age and gone global. There are exciting devel- opments, at policy and project levels, in North America, Europe, Africa, Asia and Australasia. This article describes some examples of the innovative HIA work occurring in each of these continents. This is a personal website and all views, errors and omissions are my own. Plus, though this site showcases work that I have been involved with that is in the public domain this site does not represent the people and organisations I am employed by or have worked with.